Open the can of biscuit dough. Place biscuit dough pieces on a floured cutting board. Roll out each piece of biscuit dough to a flat circle—approximately 5 inches in diameter. 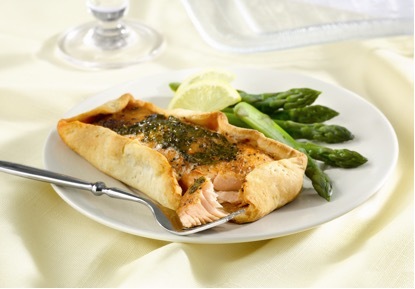 Place one No Name® Salmon fillet in the center of each piece of dough. Remove the pop-up timer and replace it on the top of the fillet. Fold the edges of the dough around the salmon leaving the center of the salmon exposed. Top each salmon fillet with 1 teaspoon of basil paste. Bake for 20-25 minutes until pastry is nicely browned and the salmon is cooked through. Serve with rice and sautéed fresh vegetables.